Ukiyo-e is a type of Japanese woodblock printing that was developed more than 400 years ago during the Edo period. It has been treasured as a traditional art of Japan, and this tour lets you explore the life of Ukiyo-e artist. Through this tour, you'll have a change to meet the artist as you experience a part of their work. You will be visiting the house of the Ukiyo-e artist where he lives and works. Once you arrive at the house, the Ukiyo-e artist will introduce himself and talk to you about Ukiyo-e. 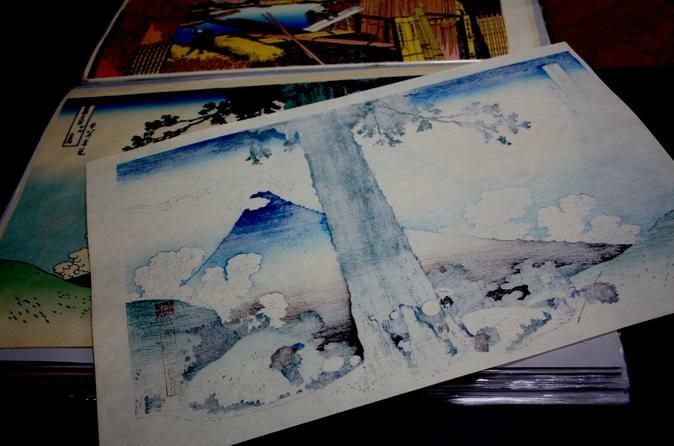 He will show you first how Ukiyo-e is created, and let you experience a piece of his work. You will then have some time to relax and talk to the artist and ask him any questions you may have. After spending 2 or 3 hours at his house, you will head back to the departure location to conclude the tour. Since this tour is held in a small group, you are sure to establish a strong connection with the artist during the tour. There will be a translator to help you communicate with the host, so you do not have to worry about the language barrier. *Please note: the time and place of the beginning of the tour may change. Please refer to the booking confirmation and Tour Detail email that you will receive after booking.